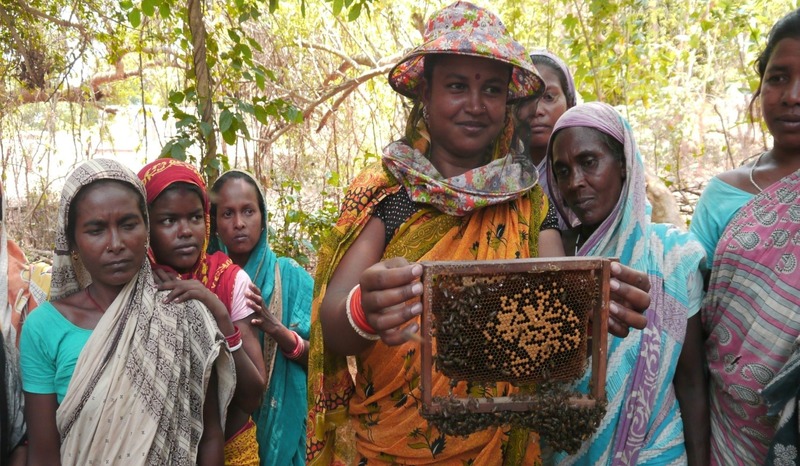 As a result of The Madhu Network Extension Project (MNEP) which provided training and support for Jani to become a beekeeper, her working day and quality of life has changed dramatically. As a member of the Badakuradangi Self Help Group (SHG) she is able to save Rs.50 (approx. £0.50) per month and in one year she has saved Rs.600 (approx. £6). Her husband was also trained to collect wild honey from the forest using scientific sustainable methods of honey collection. Jani and Sudam also help to work a communal vegetable garden along with other SHG members. Throughout the duration of the project, Jani collected 3 kg of honey from her beehive and Sudam collected 6 kg of honey from the forest and sold their honey to JRP which generated Rs.2700 (approx. £27) of income. They also earned Rs.1300 (approx. £13) from the sale of SHG vegetables. Now they generate an additional £40 per year to meet their family’s needs. The children now regularly attend school and their parents have purchased new clothes and shoes for them to help celebrate the Dussehra religious festival. Jani and Sudam were also provided with a toilet under Project PANI, supported by JRP & Jeevika. No longer do they need to use the forest for open defecation. Jani and her family’s quality of life has changed for the better with the Madhu Network Extension Project. But there are many women just like Jani who still need our help. For more information on our projects please visit our currents project page on our website.